The Sun Maiden brings a lift to our hearts, a smile to our faces, and a warmth to our souls. On those dismal days of grey skies and clouds, many of us feel a "lack of". We may tend to want to curl up on the couch and do nothing, as if in our own little cave.I am ready to emerge from winters cave. I am anxious for the Spring, sunshine, the blooming of life, and getting my hands in the soil and planting my dreams. When the Sun Maiden arrives, she greets me with a blank canvas and says "What can you manifest today?" 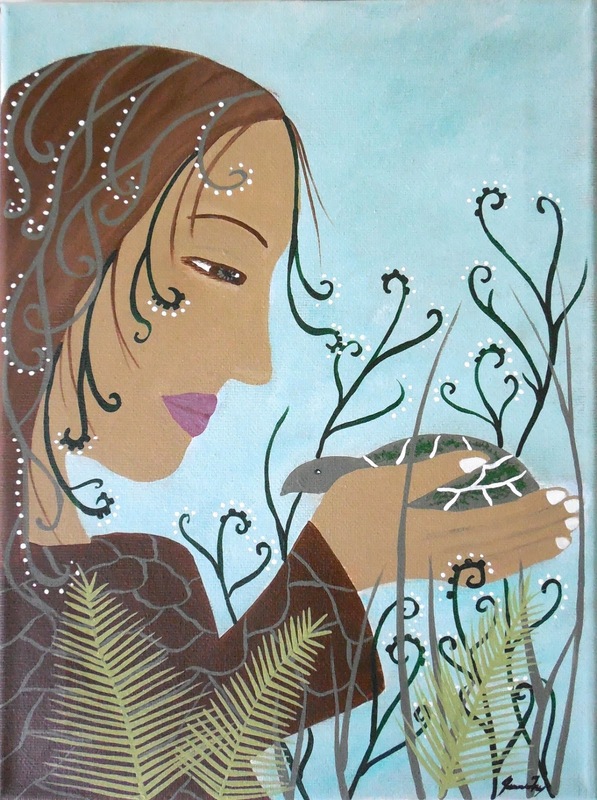 I created Grandmother Willow Tree after a weekend of reflecting on the women that came before us in our bloodlines... the grandmothers and their wisdom. While sipping tea over this cold grey weekend, I sifted through memory after memory of the images,symbols, and wise words that came from my grandmother. I replayed the short film -like snippets of remembered times when I was young and the times I spent with her. The things you learn from a grandmother are like no other. I even think that the things you learn from them may not even be the same things that they taught to their own children. I think a sense of ease comes with their age, a letting go of the overly-protective mode they were in when they were child rearing. I recalled many conversations sitting on the porch swing with her, and now realize that the things we talked about were about the "bigger picture", idealism, and inspirations. She didn't need to raise me to learn how to "walk" in the world" like a mother does, but passed her wisdom on how to "be" in the world. 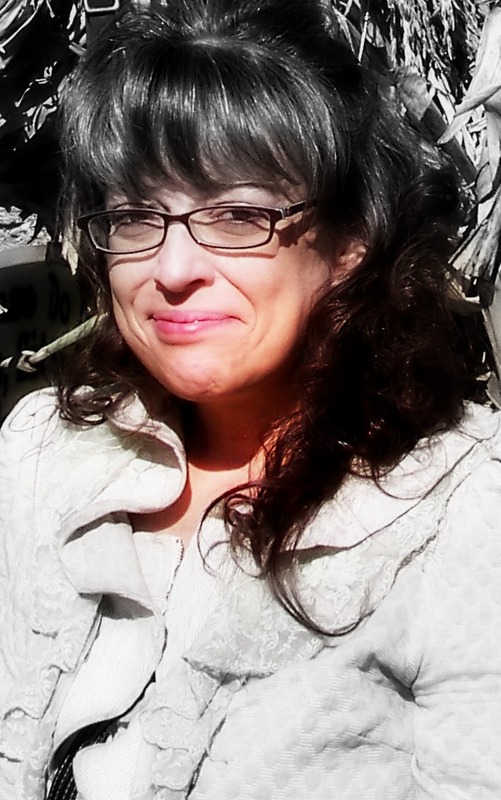 As we would sit on the porch swing, I always gazed at the Willow Tree off in the distance. It was the first thing I saw when I would arrive on her land, and the last thing I saw when I would leave. Whenever I would see that willow tree then, and see a willow tree today, I feel the Comfort of a Grandmother's Love. I am so grateful for that memory. The original painting has sold. It is available as an Art Print in our Fine Art America online shop, as an Art Print, Matted and Framed, On Canvas, On Metal, or as a Greeting Card. The Willow Tree has always been a beautiful and meaningful symbol to me. Its sacredness is rich in history and culture, having been held dear by the Celtic and Druids. It has been known as a tree of great mysticism, associated with psychic ability and vision, which explains it's relationship with the Moon. It is linked with the water element, and the flexible movement of the tree is representative of our need to adjust or acclimate along our journey. 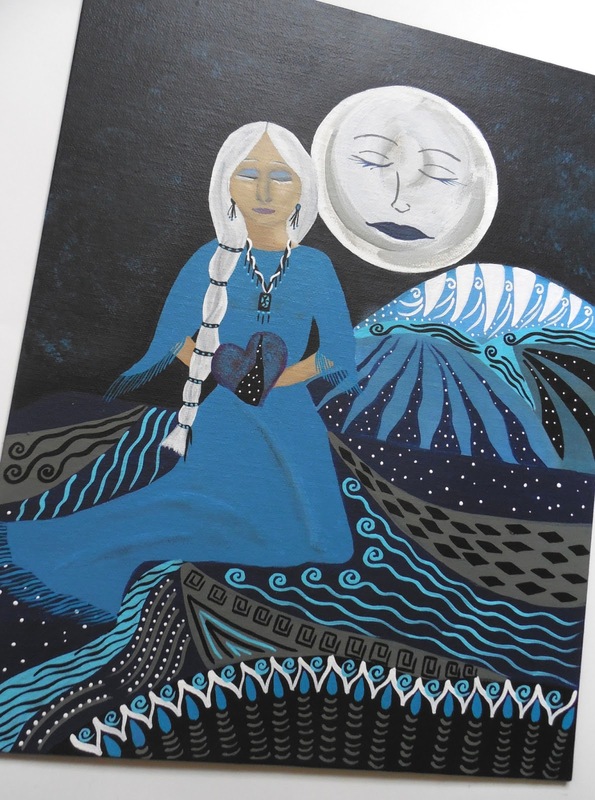 The Water/Moon connection helps facilitate a "walking with grace" attribute, in our attitudes and actions. It is a wonderful symbol for those that are working on deepening their connection with their own intuition and are learning to be flexible with life along their spiritual journey. Sleep, our natural restorative process, has become like a distant friend that has slipped away for many of us. It's a chronic problem for many, grown from stress, illness, pain, and worries. I wanted to paint this important part of our lives, that so often gets neglected. On the canvas, my goal was to bring to life the energy of sleep, the dreamtime, that place that is all our own to heal, problem solve, and connect with our inner self and intuition. 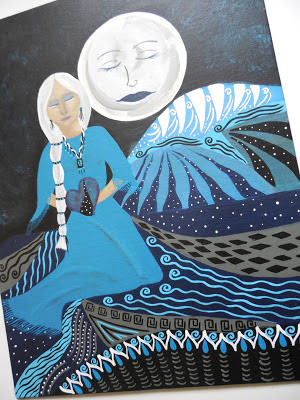 Bringing forth the colors of night (paynes grey, black, midnight blues), I integrated in soothing colors of periwinkle blue, turquoise, aqua, and shades of white. Details of sacred spirals and power symbols adorn it's landscape. 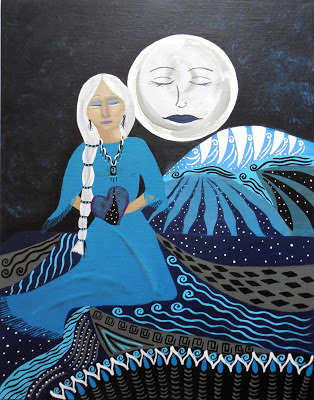 The woman, a wise sage, is the Guardian of our Dreamtime. She brings comfort and protection during our process. Her long white braided hair is symbolic for the purity of our spirit. 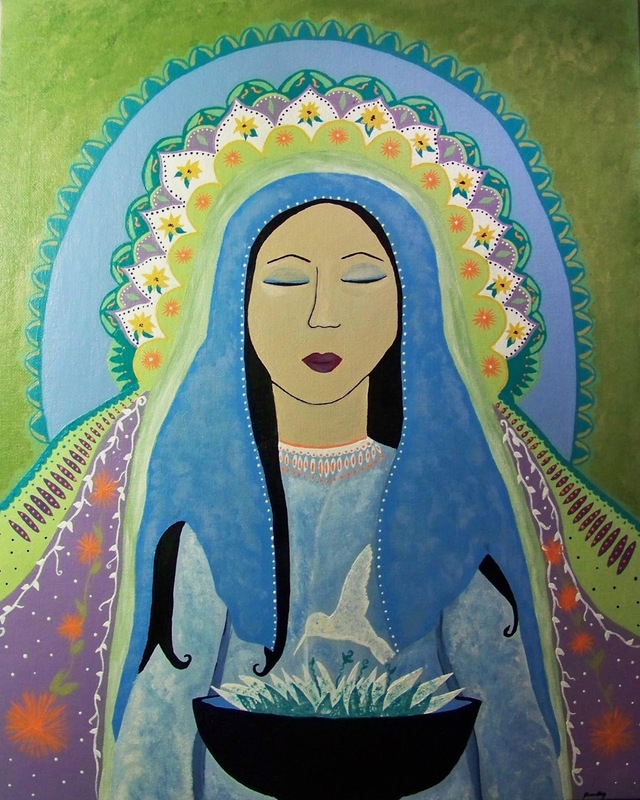 She wears turquoise for healing, and holds a heart to represent the healing of the heart by releasing past disappointments. She draws her strength from the Moon, the mountains in the background, and the cycles of nature. Hello and I hope you're having a gorgeous day ! 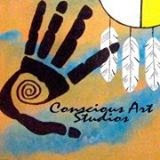 In appreciation of those who are reading my Conscious Art Studios blog, following the symbolism used in our artwork, the stories behind the paintings, and the animal totem meanings....we have had over 30,000 views. 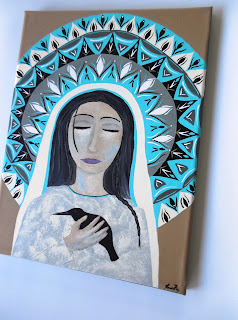 To celebrate that, I am having a Blog Giveaway for one of my Spiral Crow Art Prints, that measures 8x10. To have a chance to win it, you just need to leave a comment here on this blog post. If you share a link to my blog, I will enter your name a second time. I will choose a winner at random, Monday evening (February 18th) at 9pm. 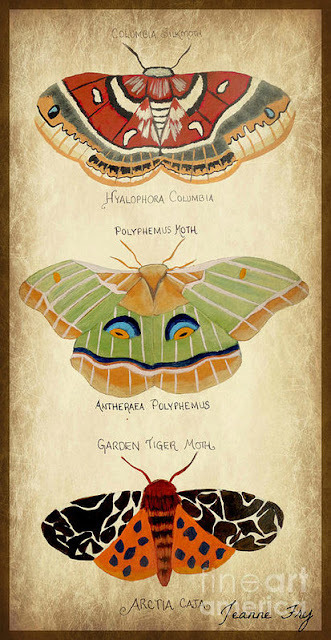 Thank you so much for loving the stories and the artwork and the symbolic beauty of Nature ! She took long walks in the woods every afternoon. Her movements were a slow pensive wandering, while her mind was racing like a marathon runner. She was not lost, but she was searching...asking...open to guidance. There was a space in heart where discouragement lived, and that space seemed to be becoming a permanent resident.She had been working so hard to bring her dreams to fruition, so hard in fact that she had fallen out of balance. It was as if she had blinders on and only saw one path, one road, one way. Opportunities had become limited, for while she was looking this "one way", she didn't see all that was around her. After time she started to believe that there were no opportunities, and she slipped into a mode of scarcity. While all of these thoughts swirled through her mind during her walk, she sat down on an old log that was laying on the forest floor. Surrounded by the lush botanical garden in the woods, with delicate ferns tickling her cheek, and flower buds whisking against her ankle, she closed her eyes. She took a deep breath in smelling the sweetness all around her, and took a deep breath out, relaxed her shoulders and let the worries escape. Everything became still in the forest, not a bird chirp or a squirrel rustling, just stillness. And she heard a whisper. A turtle slowly stepped into view from the fern growth. Familiar it seemed. She thought back to childhood and how often turtles were in her life. 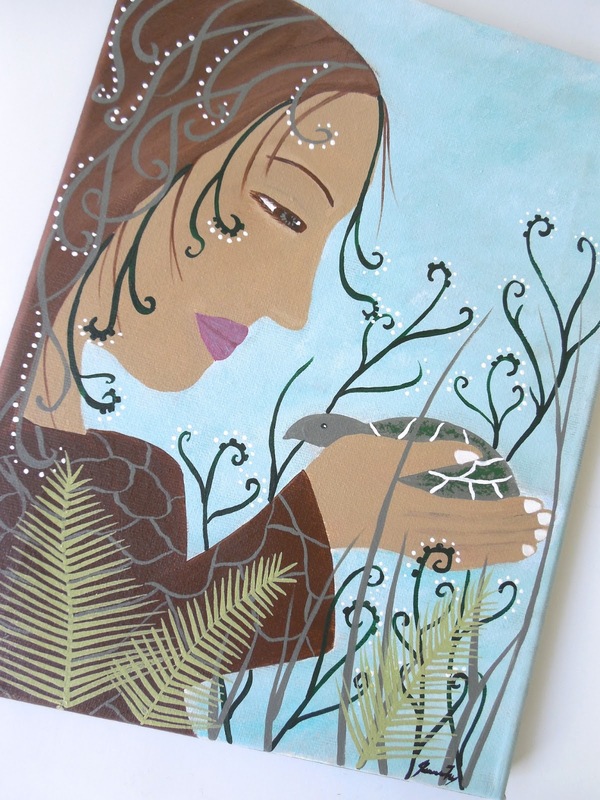 The turtle whispered, and although it's mouth did not move, she could hear the words. "You are protected. You are nurtured. You are taken care of and watched over." "Everything you want and need is available to you in this abundant universe." "Remember the circle child, the flow of life, the giving and receiving, the balance." "Open your eyes and your heart". Then the turtle slowly turned and walked away. Her Turtle Totem had returned. That old sense of connectedness returned. And that space in her heart that discouragement had rented, was now vacated leaving room for hope and confidence. She stood up from the log and bent down to straighten up where she had been. She stroked the ferns, pulling dead leaves from them and picked up small twigs and rubbish, leaving it better than how she had found it. She took a deep breath in, and out, and felt her eyes widen to see more than she had seen in a long time. She saw Hope. Thank you my Turtle Totem. This story I wrote one evening, was the inspiration of my painting, "Turtle Totem Whispers Wisdom". Our Reclaim Your Inner Peace Guided Meditation CD is a project that was dear to our hearts in it's creation. 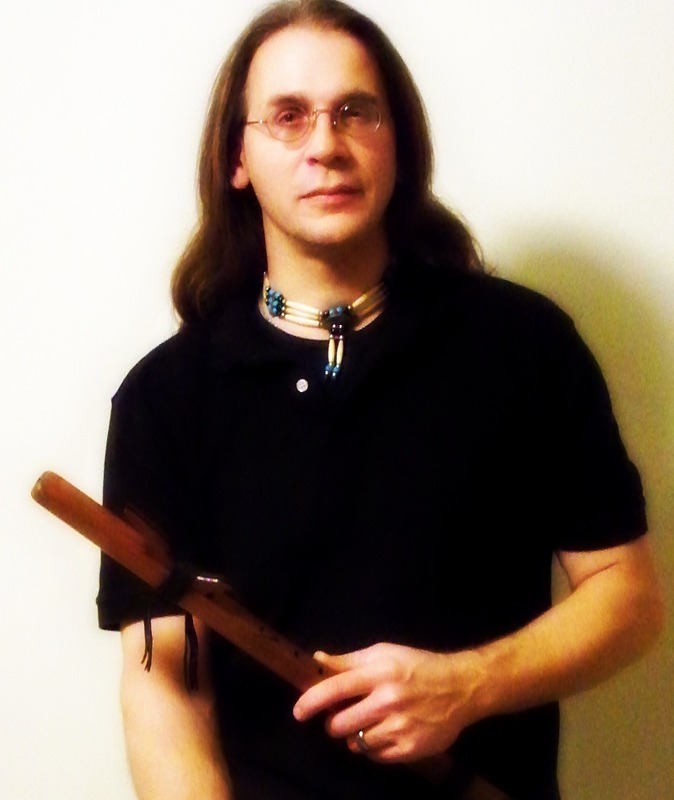 Jeanne and John Fry collaborated together for this CD, with Jeanne writing and leading the meditations vocally on the CD, and John writing and performing the Native Flute music. Those two components together gave birth to beautiful meditation work, bringing peace and relaxation woven with the gorgeous flute music. There were certain components that were important to Jeanne in the creation of the CD. 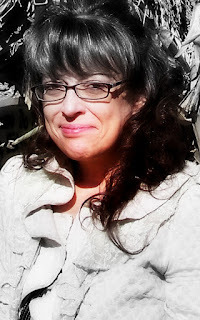 As a Traditional Usui Reiki Master and Meditation Leader, Jeanne wanted to begin this peaceful work with a "Letting Go" meditation to begin, a shedding of the days worries and stresses. Once this was completed, she wanted to guide through a Chakra balancing of the seven main chakras (Root Chakra, Sacral Chakra, Solar Plexus Chakra, Heart Chakra, Throat Chakra, Third Eye (Brow) Chakra, and Crown Chakra). Chakras (Sanskrit name for wheel) are spinning wheels of energy (prana or life force) within the body. 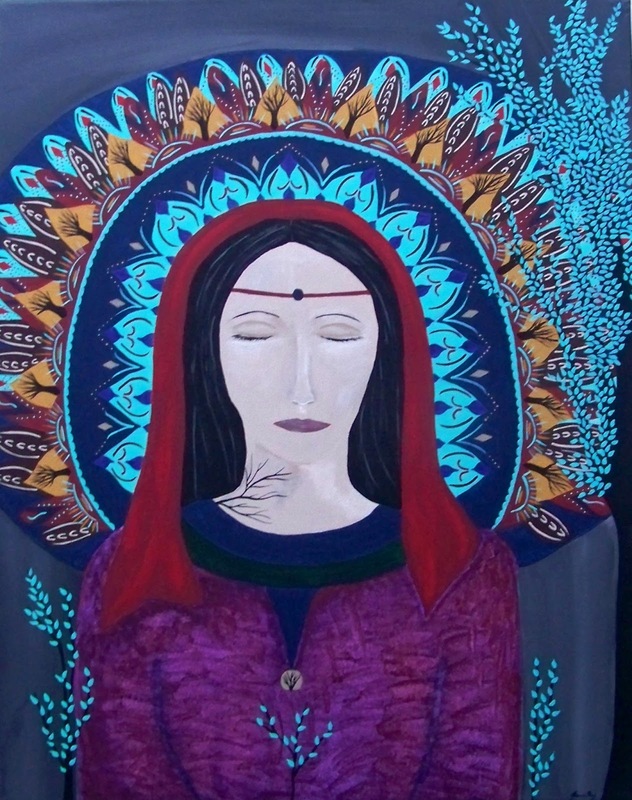 Once through the seven chakra meditations, she included a meditation on Connecting with the Divine and then concluded the CD with a meditation on Gratefulness. Each meditation on the CD is on it's own track so that you can maneuver through it easily. If one day you only desire to do the Letting Go meditation for example, you can just key up that track. If you work through the entire CD, which is a bit over an hour, each meditation is separated by the sound of a tinghsa. The artwork on the cover of the CD is a reproduction of one of Jeanne's paintings of the Owl Butterfly. Thoughtful moments were spent this week on the Connectedness of Life, in turn inspiring a new painting. As my passion as an artist always seems to navigate to nature, so was born "Sacred Trees". As I painted the tree grove I thought about how everything we think, everything we do, affects not only ourselves but those around us. How these actions extend themselves within our home, our work, our friends, our family, our community....how each choice ultimately affects our entire world. I contemplated on whether each person thought of their decisions in that way...not only how it would affect them, but how would it affect the higher good? 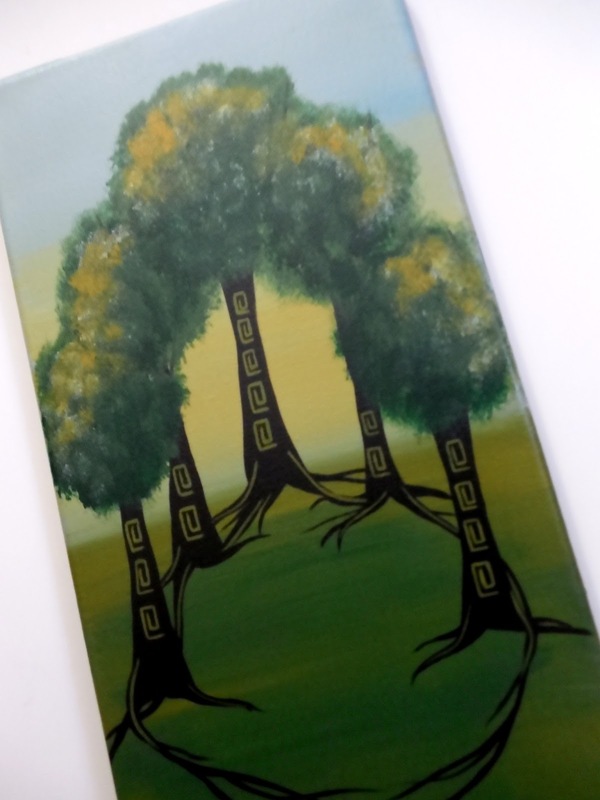 The Sacred Trees painting is a reminder, a reminder of how we are all connected. 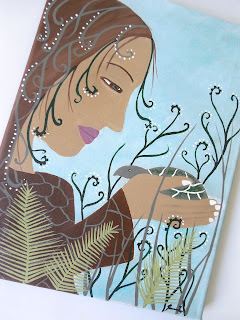 With paintbrush in my hand, I wanted to express "being present" in the moment. With nature being my biggest inspiration in my art, the Cherry Blossom Tree quickly began to appear on the canvas. The Cherry Blossom is loved by many cultures, giving appreciation to it's beautiful delicate blossoms that break into bloom quickly and with great vibrancy. Sadly the blooms do not last long. It is a reminder to us to appreciate every moment and live it to it's fullest...to become all that we are meant to be without holding back...and to be aware of the beauty of life that surrounds us. When I have those times of feeling overwhelmed by the "little stuff" that seems like "big stuff" , I think of the cherry blossom and Enjoying the Moment. Have a most Beautiful, Love Filled, and Magical Day ! "She Listens" is the third painting in my series "Chasing the Goddess". I will be writing extensively on the deepest meaning of the entire series when I get close to completion, but will give you some brief thoughts now. 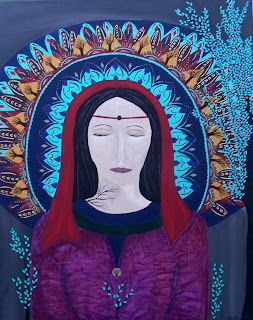 When I painted the first painting "The Divine Feminine", it came to my attention how so many connected with her, each having a different name for her and how they related. Some felt she was Mother Mary, others felt Mary Magdalene, some Guadalupe, and others likened her to Kuan Yin. To some extent they were all correct. In my heart, I feel that in the bigger picture they are all the same, it is her essence not her name that is the focus. She was the Goddess, the Divine Feminine. She is what we all connect with in the deepest part of us, whether you are a man or a woman. She is the authentic Feminine Energy, that brings a balance to our world, nature, spirituality, and the Universe. Recently I was asked why the first three all have had their eyes closed. The series is a journey, of discovery and feeling. As it unfolds there will be changes in her as all of her aspects come together. 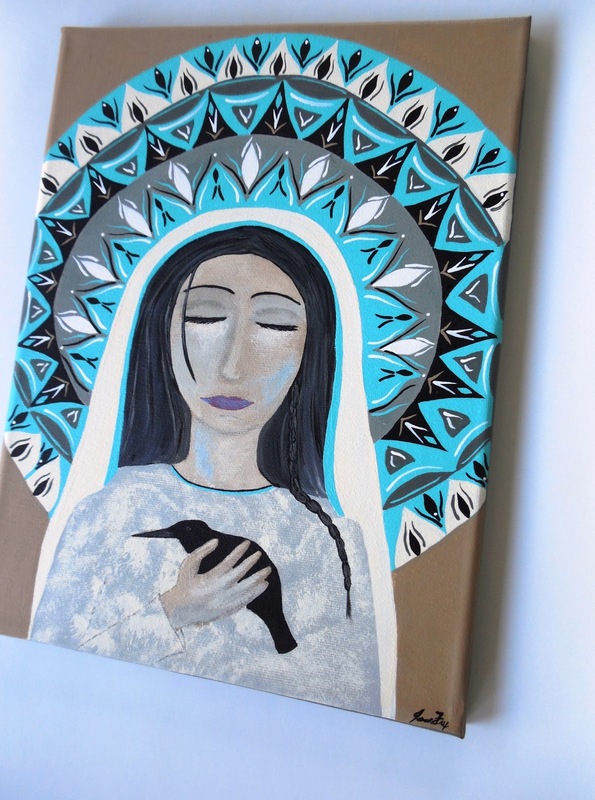 The final painting in the Chasing the Goddess series, will have her eyes open, authentic...the source...the energy...to which we are all connected with. 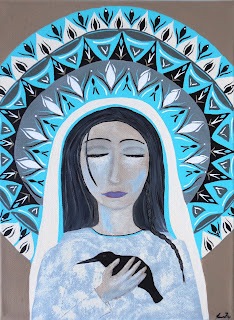 "She Listens" is what we are being asked...to hear the messages we are being sent...to hear our own voice...to hear the voice of the world. She is a bit older in this version, with her hair turning grey. She has a sage wisdom within her from the oldest parts of her soul, where her intuitive self comes with a natural ease and stands in the forefront giving her a confident, pure, and compassionate heart.